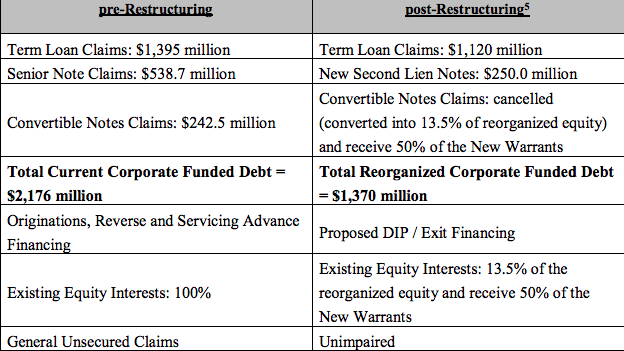 New Chapter 11 Bankruptcy - Walter Investment Management Corp.
11/30/17 Recap: Mortgage banking firm focused primarily on the servicing and origination of loans, including forward and reverse loans, has filed a much-anticipated prepackaged bankruptcy with the intention of shedding nearly $800mm of debt from its balance sheet. The company originates "conventional conforming loans eligible for securitization by government-sponsored enterprises, such as Fannie Mae and Freddie Mac, or eligible for guarantees by government agencies, such as Ginnie Mae MBSs." If that was painful reading, imagine how the lawyers felt drafting that. Even more painful is understanding that this bankruptcy is directly attributable to decisions the company made in the aftermath of the financial crisis. From 2010 through 2015, the company went on a debt-ridden acquisition spree (including once bankrupt Residential Capital LLC) which just goes to show that, while one's crisis is another's opportunity, one's crisis could be one's crisis. With this deleveraging transaction, the company hopes to be more competitive in the market going forward. Credit Suisse AG, Wilmington Savings Fund Society FSB, Wells Fargo Bank NA, Weil, Alvarez & Marsal LLC, Houlihan Lokey, Prime Clerk LLC, Davis Polk, Carlson Capital LP, TAO Fund LLC, Credit Suisse Asset Management, Marathon Asset Management LP, Nuveen Asset Management LLC, Symphony Asset Management, Eaton Vance Management, Kirkland & Ellis, FTI Consulting, Milbank Tweed Hadley & McCloy LLP, Moelis, Financial Services, SDNY, Judge Garrity, Residential Capital LLC, Pryor Cashman, Thompson Hine LLP, Alston & Bird LLP, Credit Suisse First Boston Mortgage Capital LLC, O'Melveny & Myers LLP, McKool Smith PC, Fannie Mae, Freddie Mac, Canyon Capital Advisors LLC, CQS UK LLP, Deer Park Road Management Company LP, Lion Point Capital LP, Oaktree, Omega Advisors Inc.